Less than twenty minutes from Sorrento, on the line between the sky and the sea, one of the most beautiful and lush islands in the world: Capri. Famous all over the world for its landscapes and social life, for the well known caves and luxurious shopping, Capri is one of those places that captures your heart and conquers your soul. When you arrive in Marina Piccola, the port of Capri, you will feel the energy and the vibrations that inhabit the island, whether you are there for a daily tour or for a few days more, here are some of the sites that are an absolute must to visit when on on the island of Capri. Famous all over the world for its grottos, among all, the Blue Grotto is one of the most visited attractions on the island. In addition to the turquoise reflections of its crystalline water, it is the experience to enter the cave when you visit that makes it truly exceptional. The access is only possible with the famous boatmen on the traditional fishing boats, with a little rowing and occasionally clinging to the peaks, he will guide you into this enchanted cave. Do not miss the Green Grotto, located on the southern side of the island, just after Marina Piccola. Its unique emerald reflections and crystal clear water will give you a unique experience. Villa Lysis, which can now be visited thanks to restoration carried out a few decades ago, is a villa designed in 1905 on behalf of the French poet, Count Jacques d’Adelsward-Fersen, who made it his home. Parisian by birth and descended from the Swedish Fersen family, the count came from a very wealthy family which was a leader in the steel industry. After the death of his father he inherited the heritage, Fersen first came to the island of Capri and moved permanently following a conviction for “contempt of public morals and corruption of minors”. In Capri he started the project for his majestic residence, Villa Lysis, initially called La Gloriette, on the northern part of the island. It was built on top of a hill at the northeast end, near the place where, two millennia before, the Roman emperor Tiberius had built his villa Jovis. The name Villa Lysis is a reference to Plato Liside on the theme of friendship and, according to modern critics, homosexual love. Left for decades in poor condition, the villa was restored in the nineties with funds from the association Lysis (founded in 1986) and the town of Capri. It is now open to visitors. From the Piazzetta, along Via Vittorio Emanuele, between the shops and the daedalus of alleys, you will find yourself in the heart of Capri. To welcome you is the scent of waffles prepared on the spot by the gelateria Buonocore (I suggest you try the flavour Fantasie di Capri), and a little further along, one of the most famous nightclubs in Italy, Taverna Anema e Core. At the end of the road the Quisisana hotel this is situated on via Camerelle at the start of the main shopping street of Capri. Elegant and clean, here you will find the luxury boutiques of the island, splendid hotels and villas hidden behind lush gardens and hedges. Continuing along via Camerelle, you will cross via Tragara, one of the most picturesque streets of Capri. 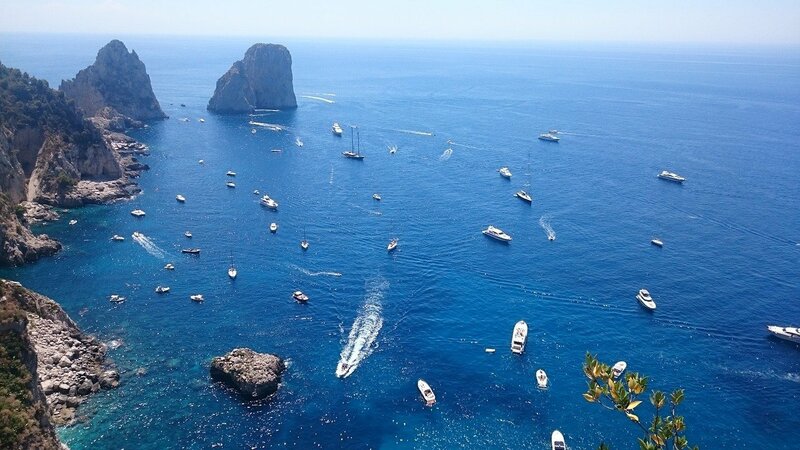 The road is surrounded by gardens and villas loved by artists and celebrities, it ends with a wonderful viewpoint that offers one of the most beautiful sights of Capri. From the panoramic viewpoint of via Tragara, it is possible to admire the Faraglioni and the bay of Marina Piccola. Under the belvedere you will find the wonderful trail that leads to the Natural Arch and Pizzolungo. Along the path, one of the masterpieces of Capri architecture, the villa of Curzio Malaparte plunged into the rocks and greenness of Capri. It is precisely from the viewpoint of Via Tragara that uncoils the Pizzolungo trail, a fantastic path that runs along the western side of the island and that overlooks the Faraglioni, up to the Natural Arch. It is recommended to take this walk starting from the area of ​​Matermania, from the Natural Arch, proceeding to villa Malaparte to end just at the Tragara belvedere. The walk which can last around two hours, ends exactly at the Tragara lookout point. Just before reaching the belvedere there is a path that allows you to get to the Faraglioni, and located at the foot of the giants of stone, the restaurant da Luigi and the bathhouse La Fontanina. Icon of high society and the life of Capri, the Piazzetta is considered the centre of the island, it is from here that alleys criss cross into streets that lead to scenic places and luxury shops. It is a firm favourite for visitors who take an aperitif cocktail or a coffee. They take their seats at one of the four bars. On the square the Clock Tower overlooks the Piazzetta, and a stone’s throw away is the funicular to reach Marina Grande. With its 598 meters, Mount Solaro is the highest peak of Capri and offers a spectacular view of the island, the gulf of Naples and Salerno and towards Ischia. It is really simple to reach, from Marina Grande or from Capri, by taxi or by bus, in 15 minutes you reach Piazza della Vittoria in Anacapri. From here you can take the chairlift, or if you prefer go on foot from via Capodimonte to via monte Solaro and then follow the path.The descent on foot is certainly easier and takes about an hour, in any case, the detour to the hermitage of Cetrella, located in the little valley of Cetrella, (so called for a grass that grows in abundance) is a must. Known throughout the world for its characteristic zig-zag and its fantastic panorama, the Via Krupp, designed by the famous German industrialist A.F.Krupp, was built in 1902. It is said that the German entrepreneur, who was staying at the Quisisana hotel, bought the “Fonda Certosa” where part of the gardens of Augustus are located and built a winding road that leads to the sea, to be able to quickly reach his yacht anchored in Marina Piccola. For safety reasons due to landslide risk, the road is closed most of the time and therefore can only be admired from the gardens of Augustus, which are located just above Via Krupp. In the most extreme point south-west of the island of Capri, there is the famous lighthouse of Punta Carena which was built in 1866 and is considered among the most important of the Tyrrhenian Sea, second by power only to that of Genoa. This picturesque creek carved into nature and among the rocks, hosts a Lido del Faro, a Lido restaurant where you can sip a cocktail until sunset or dive into the deep water of a BLUE flag sea, amid the wild beauty of surrounding nature. The restaurant is open from the middle of April to the end of October every day from 12noon until sunset. With a breathtaking view of the Gulf of Naples, about 300 meters above sea level, Villa San Michele dominates the northern side of the island of Capri. Surrounded by an enchanting garden, it was the work of the Swedish physician Axel Munthe, who visited the island for the first time to seek treatment for pneumonia. For many years the villa has been used as a museum which houses many finds from the Roman era (vases, columns, marbles). Its gardens are a triumph of flowers among pergolas and centennial cypress trees overlooking the gulf of Naples.